Localyse announces their participation at Intertraffic Amsterdam, the leading trade event for traffic technology professionals. The traffic industry is undergoing major changes and developments are on a fast track. The visitors can experience the latest solutions for today’s and tomorrow’s challenges with lots of interesting keynotes and presentations of all the experts in the field. They can discover the latest trends in infrastructure, traffic management, smart mobility, safety and parking! Localyse will expose interesting mobility cases and customer stories in the Smart Mobility Center (hall 8, booth: 08.403). Our Localyse team will be looking forward to answer all your questions around Google Maps. 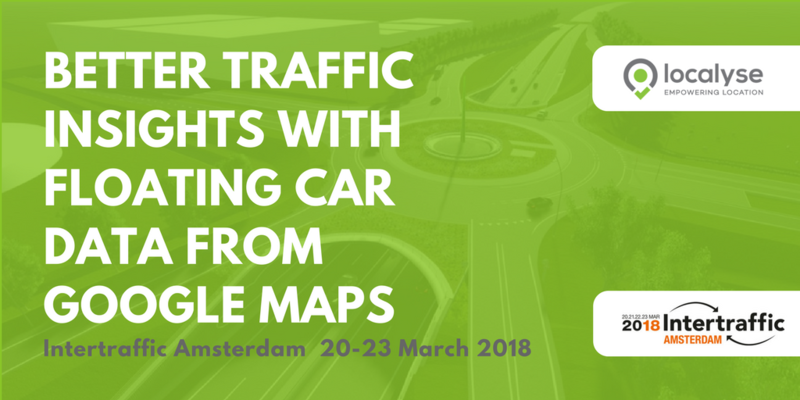 On wednesday 21 March 2018, Jelle Draijer and Jeffrey Benning, will present our keynote ‘Traffic Insights through Floating Car Data (FCD) from Google Maps’ on the INTERTRAFFIC. Both experts of mobility solutions with Google Maps will provide an introduction into what Google Maps’ FCD can do for a (Mobility) organizations through the innovative tool ODIQ; an unique web-based tool providing traffic insights for more than 200 countries worldwide. ODIQ measures and analyzes travel times, delay times, average speeds and congestion points on a chosen route from a to b. This leverages mobility experts relevant insights into how, where and when roads are used, without the need for physical sensors on location. Due to the rich data behind Google Maps, the results are accurate on state-, intercity- and sub city-road level and can be an useful traffic tool for organizations that maintain, build, own or manage roads. Examples and use-cases (Construction company and municipality will be provided). The registration for visitors is FREE of Charge – until 12 of March. Afterwards a fee of 40-70 Euro per person will be charged. Register now!